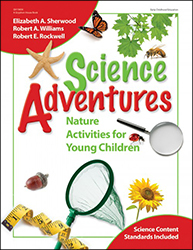 With more than 125 activities, Science Adventures opens up a world of exploration through nature activities in urban, suburban, or rural settings. From Big Step Measuring and Rocks That Write to The Ant Restaurant and How Far Can You Squeeze a Squirt?, the engaging activities in Science Adventures make exploring the environment fun and easy! The authors have adapted the kindergarten science standards set by the National Academy of Sciences to make them developmentally appropriate for preschool children. Each chapter focuses on one of these standards, and the activities within each chapter progress from simple to more complex. Many of the activities feature suggestions for including families, adaptations for English language learners, modifications for children with special needs, or appropriate ways to use technology with young children. The activities also incorporate assessment components and ways to relate topics across curriculum areas.